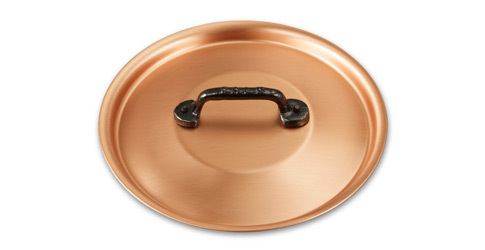 We know you'll love this	18cm copper lid	as much as we do. 4.8 stars out of	5 based on	3 reviews. 1269 customers found this review helpful. Did you? Yes, I did! Excellent Perfect companion lid to the 18 cm Saucier pan. Lighter weight copper therefore easier to use. 1185 customers found this review helpful. Did you? Yes, I did! 1182 customers found this review helpful. Did you? Yes, I did! My first lid This lid is round, produces a nice ring when tapped with a wooden spoon by my son and looks perfectly in place on top of a Falk pan. 1173 customers found this review helpful. Did you? Yes, I did! Sturdy lid Essential extra for the 18" Pan. 1167 customers found this review helpful. Did you? Yes, I did! Hat off to the lids The very thing to stop you steaming! 1166 customers found this review helpful. Did you? Yes, I did! Great lid Beautiful lid, love the finish and the handle. The interior is also brushed steel, and easy to clean any splatters off. Fits nice and snug. 1141 customers found this review helpful. Did you? Yes, I did! 18cm Copper Lid Fits well and looks good. Buy one I originally had doubts whether I'd be using this lid but I find myself using it all the time. Fits the 18cm pots perfectly. 1140 customers found this review helpful. Did you? Yes, I did! it's a must! bought it as an accompaniment to the 18cm pan - beautiful accompaniment and fits perfectly! Great! Bought with the 18cm saucier on the introductory offer. Partially to get free delivery, partially because I wanted it! Perfect addition to the pan, I use it to slowly cool sauces down. 1138 customers found this review helpful. Did you? Yes, I did! Perfect match Perfect match for my beloved saucier. 1126 customers found this review helpful. Did you? Yes, I did! Complete the pan Apart from looking good on the pan it also speeds up boiling and helps to keep the food warm making the pan more versatile.On the downside I do not find the handle stays cool,when it has been over a boiling pan of water for a few minutes and have had to use a cloth to remove it. Minor point and would still recommend it. not the snuggest fit you can not, not having the lid! but like all FALK lids, this is not the snuggest and the most accurate fit for the product. It has a bit of room to manoeuvre which I don't like but it shouldn't effect the cooking process. 1117 customers found this review helpful. Did you? Yes, I did! Completes the pan and makes it more useful. Looks good and fits well, really adds to the usefulness of the 18cm saute pan. 1109 customers found this review helpful. Did you? Yes, I did! A lid for the 18 cm saucier pan I rate the website well and service has been good. The lid fits and the handle stays cool enough to handle - but otherwise - it's a lid. 1103 customers found this review helpful. Did you? Yes, I did! Essential item! I bought the 18cm copper lid to complete the purchase of my 18cm copper saucepan. It's difficult to say anything particularly helpful about a pan lid but I would say that the fact that the lids keep food warm in the pans after I have finished cooking makes them an essential piece of kit. I love my Falk copper pans & am pleased I bought the lids to complete the sets. I would definitely recommend! 1096 customers found this review helpful. Did you? Yes, I did! 1087 customers found this review helpful. Did you? Yes, I did! Great Lid Compliments 18cm saucier perfectly. Usual Falk high quality. 1077 customers found this review helpful. Did you? Yes, I did! To praise the products sold by Falk. A joy to use - great looking too. The best! That is our point of view! 1076 customers found this review helpful. Did you? Yes, I did! A Must Have I cannot believe that it has taken me this long to realise how important it is to have a proper fitting gorgeous lid. Remember "Inherit Tin Lined buy Stainless Steel"
1073 customers found this review helpful. Did you? Yes, I did! Lid for saucier With the try me offer price, I didn't need to think. Lid 18cm copper This lid is perfect for my 18cm copper saucier. The quality of the workmanship is evident in many ways, from the handle that will never come loose, to the smooth finishing, both inside and out. I love it! Perfect fit Bought this together with the 18cm Saucier Pan. It looks stylish and more importantly it does what a lit should do. A high quality lid I had doubt about buying lids due to the price but it is very worthwhile because it fit extremely well and tightly to the pan, no air or gap in between at all. And it has an overall attractive appearance. Very good quality. Spot on This lid certainly compliments my pan and makes it use even more versatile. 1059 customers found this review helpful. Did you? Yes, I did! its a lid its a lid - does the job well. 1050 customers found this review helpful. Did you? Yes, I did! Great service, great products! My order arrived very promptly and exactly as I'd expected - thanks so much Falk! 1036 customers found this review helpful. Did you? Yes, I did! High Quality lid Just like everything else from Falk this is of a superb quality. Well engineered for what it's supposed to do (cover pan, have some give so pan doesn't explode). Looks very nice also! 1027 customers found this review helpful. Did you? Yes, I did! Best birthday gift ever! Beautiful pinkish copper lid. 1022 customers found this review helpful. Did you? Yes, I did! Fit for purpose I have 18, 20 24 and 28cm lids and have no criticism of them. I am using this opportunity to say that the pots and pans are really worth considering. I find them strong and practical and have not regretted buying them. They are not gimmicky and I do not have to be very careful in my treatment of them. I realise that the reviews are not to be about the company but I think they are really good to deal with and Neil is very knowledgeable and patient. 1001 customers found this review helpful. Did you? Yes, I did! My most precious collection in my kitchen The lid is very well made and I found it essential to keep the food warm. I'm very impressed! 986 customers found this review helpful. Did you? Yes, I did! 959 customers found this review helpful. Did you? Yes, I did! Lovely lid These lids are some of the nicest I've seen in terms of looks. The cast iron handle complements the brushed copper very well, and the smooth lines are a joy to behold. They're made of thinner copper than the pans themselves which makes sense, as there is no need for them to be particularly thick. Fits my saucier perfectly. 925 customers found this review helpful. Did you? Yes, I did! A must with the saucier pan In conjunction with my 18cm Saucier pan it has been wonderful cooking tool providing perfect cooking results. Cooper is the way forward !! 916 customers found this review helpful. Did you? Yes, I did! 911 customers found this review helpful. Did you? Yes, I did! The right topping I had never realised the importance and flexibility of a saucepan lid - it's integral. 877 customers found this review helpful. Did you? Yes, I did! Great product Purchased to go with the 18cm saucepan. Fits perfectly and can't be accidentally knocked off the pan while cooking. 869 customers found this review helpful. Did you? Yes, I did! It's a lid Lovely lid. Stops creepy crawlies from climbing into the pan while on the shelf, and looks good too. Probably benefits cooking as well. A must for lid fans. If I could afford two they'd probably make a great pair of high-end cymbals while not on creepy-crawly duty. 866 customers found this review helpful. Did you? Yes, I did! Not very practical I own a whole series of Falk pots and love them. I am not convinced about the lids - got them to have a matching set with the pots but they don't add to the cooking experience. They feel flimsy and the handles heat up a lot. As a matter of fact, for stove top cooking, you DON'T WANT the lid to be so highly thermally conductive - just the opposite in fact. But they do match with the pots so I use them for esthetic reasons. 863 customers found this review helpful. Did you? Yes, I did! Great Lid Bought a range of Falk saucepans and lids and have been delighted with the performance. Beautiful, easy to clean. Perfect. 858 customers found this review helpful. Did you? Yes, I did! Fabulous This is my first item Falk with cooper pan 18cm! This is fantastic design! I love them after I delivered this items I ordered more sets! 840 customers found this review helpful. Did you? Yes, I did!